Hirsch sums up the traditional Jewish reading of this text: "The cloud was the Shepherd's crook by means of which G-d, the 'Shepherd of Israel', announced His will to the People He was leading, where and when they were to encamp, where and when to break camp." Baal HaTurim observes a marginal note in the Masoretic Text and reports that "this word only appears twice in the Tanakh: here, 'the lifting of the cloud'; and , 'the lifting of the exile' (Ezra 1:11). It would have been proper that a miracle be performed for them, that is the Jewish people, in the days of Ezra, just as was done for them in the days of Moshe." The concept of the cloud lifting has entered the general vocabulary. Many people report that at significant points in their lives they have felt or seen "the cloud lift" to encourage them to move forward or take action; similarly, comments that "the cloud hasn't lifted" are used to justify delay or holding back a decision or a course of action. Although often subjective, the phrase has gained significant currency as a means of expressing a sense of G-d's presence or His direction in the affairs of men, just as it was for the ancient Israelites. The cloud only gave direction in the specific terms of when to travel and when to stop, to break or pitch camp. The Israelites also had the Urim and Thumim as a means of determining G-d's instructions in other areas: "in the breastpiece of judgment you shall put the Urim and the Thummim, and they shall be on Aaron's heart, when he goes in before the L-RD" (Shemot 28:30, ESV) and Moshe was commanded to instruct Joshua to "stand before Eleazar the priest, who shall inquire for him by the judgment of the Urim before the L-RD. At his word they shall go out, and at his word they shall come in, both he and all the people of Israel with him, the whole congregation" (B'Midbar 27:21, ESV). After the exile, this was to be the way that the status of some claiming to be priests was determined: "The governor told them that they were not to partake of the most holy food until a priest with Urim and Thummim should arise" (Nehemiah 7:65, ESV). Many ask how are we to know, track, follow and seek G-d's presence and direction in these days without the supernatural signs that the Israelites were given in their times. The Jewish world, teaching that prophecy ceased shortly after the Second Temple was built, declares that everything is in the Torah and that Jews do not depend on miracles (b. Pesachim 64b). 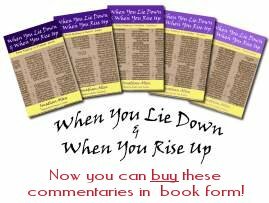 The Sages have derived many rules and laws from the original words of the Torah to cover almost every imaginable situation; by appropriate application of those rules, it is easy to determine what Adonai would have us do or say. There are some Christians too who follow the same principle, teaching that everything we need to know - every rule, every guidance that we might need - can be found in the pages of the Bible. For both of these groups, then, there is no need for further supernatural divine guidance today because the answers to all our questions have already been provided through the Scriptures. Both of these groups are also unlikely to accept that G-d's presence can or should be expected to be manifested in these days. Adonai that "If Your presence will not go with me, do not bring us up from here. For how shall it be known that I have found favor in Your sight, I and Your people? Is it not in Your going with us, so that we are distinct, I and Your people, from every other people on the face of the earth?" (Shemot 33:15-16, ESV). Adonai's presence among His people was essential so that everyone else would know that He was working among them. The Psalmist too seems concerned about losing Adonai's presence: "Cast me not away from Your presence, and take not Your Holy Spirit from me" (Psalm 51:11, ESV); he urges his people to, "Seek the L-RD and His strength; seek His presence continually!" (Psalm 105:4, ESV), but then affirms, "Where shall I go from Your Spirit? Or where shall I flee from Your presence?" (Psalm 139:7, ESV). No, he realises, there is nowhere that Adonai's presence cannot be; everywhere is within His reach. So great that the earth itself is aware of Adonai's presence: "Tremble, O earth, at the presence of the L-rd, at the presence of the G-d of Jacob" (Psalm 114:7, ESV). in times of worship - speaking about G-d, the Psalmist tells us that You are holy; the one inhabiting the praises of Israel" (Psalm 22:3). This seems to be supported by the prophet Zechariah: "Sing and rejoice, O daughter of Zion, for behold, I come and I will dwell in your midst, declares the L-RD" (Zechariah 2:10, ESV). When we praise G-d - and the text does not speak about any particular worship style or expression, save that it be joyful or rejoicing - the Scriptures tell us that G-d is present, in our midst. in times of prayer - Yeshua told the disciples, For wherever two or three are assembled in my name, I am there with them" (Matthew 18:20, CJB); the early church proved that this was so: "And when they had prayed, the place in which they were gathered together was shaken, and they were all filled with the Holy Spirit" (Acts 4:31, ESV). When we gather to pray, both corporately and individually, we enter the presence of G-d.
in times of study - the Psalmist says that "The sum of Your word is truth, And every one of Your righteous ordinances is everlasting" (Psalm 119:160, NASB), echoed by Yeshua as He asks the Father to: "Sanctify them in the truth; Thy word is truth" (John 17:17, NASB). As we study, we are sanctified - made holy - and brought into the truth by the Word and by the Ruach: "when He, the Spirit of truth, comes, He will guide you into all the truth; for He will not speak on His own initiative, but whatever He hears, He will speak; and He will disclose to you what is to come" (John 16:13, NASB). in times of serving - when we engage with the people around us and serve them, being Yeshua's hands and feet, we experience His presence guiding and directing us: "your ears will heed the command from behind you: 'This is the road; follow it!'" (Isaiah 30:21, JPS). G-d has promised to be with us wherever we go: "ADONAI will always guide you; He will satisfy your needs in the desert, He will renew the strength in your limbs; so that you will be like a watered garden, like a spring whose water never fails" (Isaiah 58:11, CJB) and Yeshua confirmed that personally for all those who follow Him: "Remember! I will be with you always, yes, even until the end of the age" (Matthew 28:20, CJB). Should we nevertheless seek the presence of G-d? The Psalmist insists that it is the only way: "You make me know the path of life; in Your presence is unbounded joy, in your right hand eternal delight" (Psalm 16:11, CJB). Application: Are you aware of the presence of G-d in your life? Do you experience Him guiding you each day? If not, then you are missing out on one of richest kingdom blessings. Claim that promise today and He will be there for you.